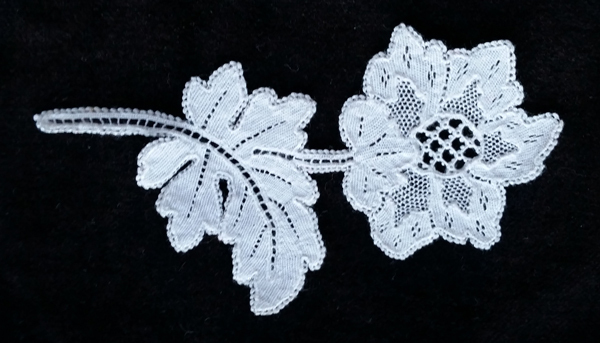 Here you can see some previously recorded demonstrations of the varied techniques of making the variety of irish laces, including kenmare lace. Simply press the Sliver Arrows at each side of the Video to skip to the next or previous demonstration. Alternatively follow the links below. To the right is a Kenmare Lace sampler from a Kenmare Lace kit that can be purchased from our online shop. In the pictures you can see how the Lace Kit takes you through all the intricate stages of making a piece of kenmare lace from scratch. The first and most important lesson is to learn the basic Kenmare Lace stitch which is the detached buttonhole stitch, step 4, filling 3. Then you will learn the variations on that stitch which builds up the pattern to make the larger designs you will soon be making. Pictured to the left is Emer Finnegan with Irish President Mary Robinson on her visit to Kenmare in June 1995. Here Emer shows her how Bobbin Lace is made. The president delays her schedule just a little to linger on in the Lace Shop and she is rewarded with an exquisit piece of Kenmare Lace on her departure. We have an extensive video gallery below. Click play on any of the video’s below to learn about the different laces made at the Kenmare Lace & Design Centre. Here, you can see videos of Kenmare Lace, Limerick Tambor and Limerick Run Lace, Irish Crochet Lace, Tatting, and Carrickmacross Lace. Just scroll down to view the demonstrations. Please don’t hesitate to comment below if you have any questions or queries.